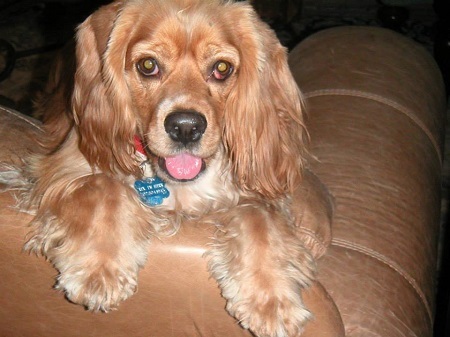 We need a forever home for Rex, a purebred Cocker Spaniel. His ‘œdad’ died in mid-November after a four and a half month hospital stay during which Rex has been lovingly cared for by neighbors in St. Johns. Rex is a 13-year-old perfect companion. He’s sweet, mellow, well-behaved and a happy dog who has eyes that can melt your heart. He was his owner’s best friend and enjoyed the same laid back music’”jazz, Memphis Blues and folk music. He loves his walks, likes to romp in a park chasing a tennis ball (or perhaps a stray rabbit). He gets along with most other dogs and cats (unless they are very aggressive of course). He’s been around kids and seems to take well to them but wasn’t raised with kids in the house. He is in need of a loving, caring, attentive home with owners who will love him as much as he will love them’”a lot!! He can stare you down to let you know he wants to go out or eat. His two favorite activities. He’s in great shape and we’d love to find him his forever home. For more information contact Andy at andydiesel@me.com.